What is it with Swedish spaces? They always seem to be so clean and simple and yet so lived in and cozy at the same time. 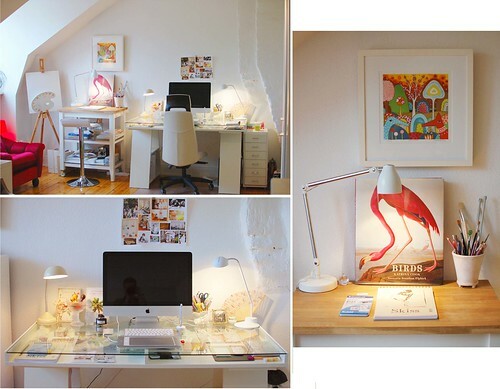 I love this studio belonging to Sanna Sporrong who recently reached out to me to share her lovely work. I think the clean white with pops of color theme throughout Sanna’s space works so well. Looking at Sanna’s space is making me feel really negligent. After moving and setting up our space we’ve sort of fallen off the decorating wagon. With preparing for my show and other freelance projects, finishing decorating our apartment has fallen to the wayside. I promise to get back into it and share photos soon. Thanks for the inspiration Sanna! i found you via design*sponge (i think!) and love opening your posts to see more of your amazing work! watercolor is an amazing medium but so challenging to control (to me, a non-artist!) so i’m always impressed with the details you are able to create. had to comment on this post b/c i, too, find that my favorite rooms are swedish…perhaps my scandinavian blood drawing me to them! looking forward to your next post…. Thanks Amy for the compliments….I do love watercolor. So happy you like Maquette!